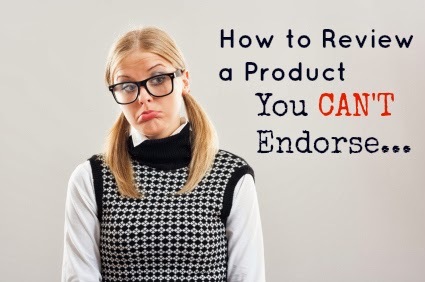 What Should You Do If You're Reviewing a Product You Can't Endorse? As a blogger, you likely have plenty of review and giveaway opportunities coming your way. Reviewingproducts can be a fun way to get a sneak peek into products that will soon be hitting the market as well as to try out things your family may need. Even better, you get to recommend the products to your readers. But what happens when you don't feel like you can recommend the product? Unfortunately, you're in a tough position. The company has likely given you the item for free to try out, and while they don't explicitly say so, they're probably anticipating a positive review. On the other hand, your readers depend on your honesty. You could be hurting your readership and your own blog by endorsing a product that you didn't care for or that didn't work. Should You Write a Scathing Review? A scathing review is probably not what you want to write. Instead, contact the company and express your concerns. Let them know (tactfully) that you don't feel you can endorse the product. The company may work with you if you had a problem with the product to see if the situation can be resolved. If it can't, they may agree that it is not in their best interest for you to write the review. Almost always, foregoing the review is better than publishing a largely negative review. What If You Have a Mixed Review? What if the product has some positives, but it also has a number of flaws? Again, you'd probably like to speak with the company first, but many companies prefer honest reviews. That means you'll state all the positives, but you'll also honestly document the things you didn't like. Let's face it, not all of your reviews can be entirely positive. Your readers will appreciate your honesty, as will most companies. Have you ever had a product you couldn't fully endorse? What did you do? This happened to me very recently. I received a tech gadget that didn't perform for me as expected. After spending a great deal of time trouble shooting, I finally leveled with my PR contact and told him my concerns. We've worked together on other reviews, and so he was very appreciative of my honesty and we agreed that no review was better than a bad review. I also volunteered to answer any questions the company might have so that they could improve the product in the future. Thanks for sharing this. I'm a product reviewer and so far haven't run into any products I dislike. Now I know what to do if I do.